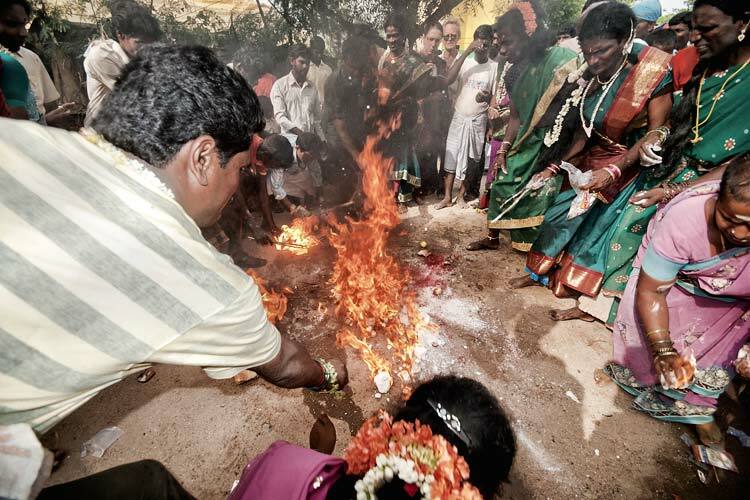 Description: As the Koothandavar (god Aravan) ceremonial procession approaches, transgenders set alight heaps of camphor. Devotees immediately pounce upon the still-burning camphor, dousing the flames, grabbing as much as each can to take back home to share with family and friends. This camphor is regarded as 'prasad,' consecrated remains of a religious ceremony. The lady in the pink sari (extreme right) is smiling as she grabs a flaming chunk in her hand.